The structure of this black baroque chair is made with beech, a noble and resistant material that offers in addition to aesthetics. The silver-colored frame is carved by hand and turns to a mortise and tenon joint, a process that has been used for a long time to provide more strength to the seat. It is covered with a black synthetic fabric fixed with upholsterers nails. As for aesthetics, this chair is beautiful to see. The fabric of which it is coated offers the advantage of aging well. It is a long life coating that is easy to maintain and offers a beautiful patina over time. In addition, it is more resistant and easily washable. It is traditionally laid with nails upholsterers. Its foam lining will allow you to be installed with ease. This seat offers both a good flexibility and firmness so that you can sit without harming the resilience of the foam, that is to say its ability to return to its original form. 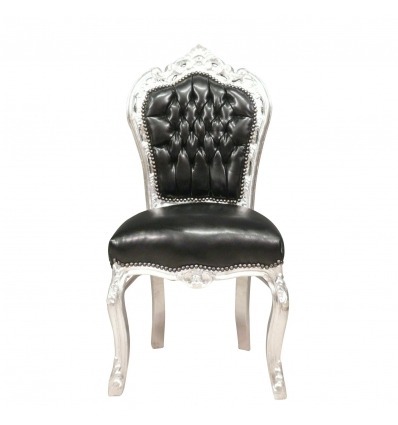 Choosing this black baroque chair is to give you the assurance of enjoying a functional seating while infusing your interior with the atmosphere of the rococo universe.